Akitsu Shikoku Ken is a small kennel located on Sanibel Island off the Gulf Coast of Florida. Our dogs also spend time at Dragonfly Brook Farm in the Monadnock Region of New Hampshire. “Akitsu” is Japanese for dragonfly. Our dogs love to chase the dragonflies found on both Sanibel Island and Dragonfly Brook Farm. We started planning our kennel when we acquired Dragonfly Brook Farm in 2011. The rural NH location provided plenty of space but also meant we had to be wary of predators such as the coyote packs we often hear howling nearby at night. 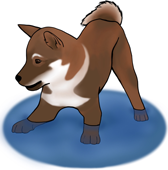 After owning a Shiba Inu for fifteen years, we knew we wanted to continue working with the Japanese breeds. We decided that one of the medium-sized Japanese hunting dogs would be best for our environment, and soon added two Shikokus to our family. Our dogs have now followed us to Sanibel Island, where they enjoy chasing the lizards and crabs. 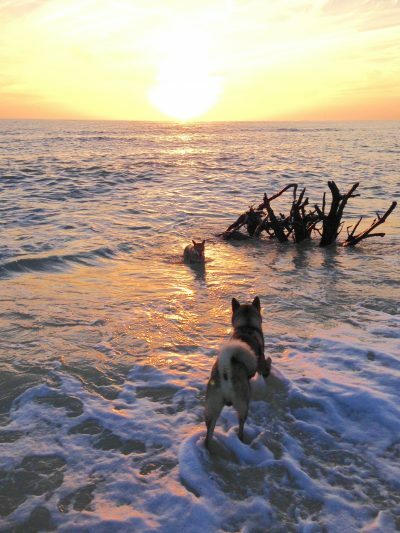 Sanibel also welcomes dogs on all of its beaches, so our Shikokus have become expert swimmers. In early 2013, we imported our first Shikoku, Setsuko (above left) from Akashima Kennel in Canada. As we got to know the Shikoku community, we learned that genetic diversity was essential to the viability of the breed in North America. This led us to Nico Reimerink’s Kasatori Sou Kennel in the Netherlands, and in late 2013 we imported Takahiro (above right) in a co-ownership with Katja Weber of Akashima Kennel. Both Katja and Nico have made invaluable contributions to the breed with their extensive efforts to import bloodlines from Japan and with the high quality of their litters. The more that we learn about this fascinating breed, the more committed we become to preserving it from extinction. The Shikoku is descended from the native dogs that hunted with the Joman people seven thousand years ago, and the isolation of the Shikoku mountains in Japan has allowed them to retain a high degree of genetic integrity. As we watch our dogs hunt, it is easy to picture their ancestors alongside the Jomon people. The Shikoku is recognized as a “Living National Monument” in Japan, where the breed has been preserved by the dedicated breeders of the Nihon Ken Hozonkai (NIPPO). The Shikoku is now the rarest of the Japanese native breeds, with only 300 to 400 litters produced in Japan each year. Outside of Japan the breed is even less common, with about a half-dozen litters per year in North America. Our goal at Akitsu Shikoku Ken is to increase awareness of the breed and to contribute to the genetic diversity in North America. We prioritize health, temperament, and conformity to the Japanese standard. All of our dogs are considered members of our family, and our puppies are raised and well socialized in a home environment.